Popular historic sites such as Sea Fortress Suomenlinna and The Esplanadi Park are in your itinerary. 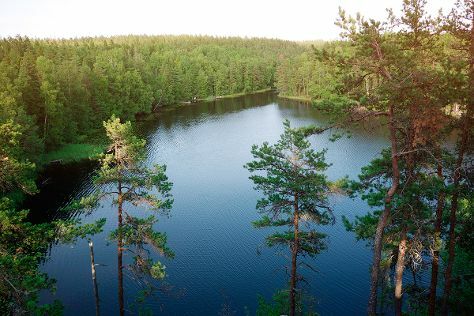 Visiting Nuuksio National Park and Hiidenkirnut will get you outdoors. Explore Helsinki's surroundings by going to Kotka (Riverside Park & Linden Esplanade), Teijo national park (in Pernio) and Sipoonkorven Kansallispuisto (in Vantaa). Next up on the itinerary: take in the spiritual surroundings of Rock Church, pause for some serene contemplation at Helsinki Cathedral, wander the streets of Katajanokka, and soothe aching muscles at some of the top local wellness centers. To find more things to do, other places to visit, traveler tips, and tourist information, refer to the Helsinki trip maker tool . If you are flying in from Russia, the closest major airport is Helsinki Vantaa Airport. May in Helsinki sees daily highs of 18°C and lows of 7°C at night. Cap off your sightseeing on the 28th (Tue) early enough to travel back home.